When is a foot not a foot? When it’s a mouse . . . or a fish . . . or a rocket ship . . . or a ghost . . . or anything you imagine it could be! So far, students have illustrated and written about Martians, clowns and monsters, and have learned all about riddles. 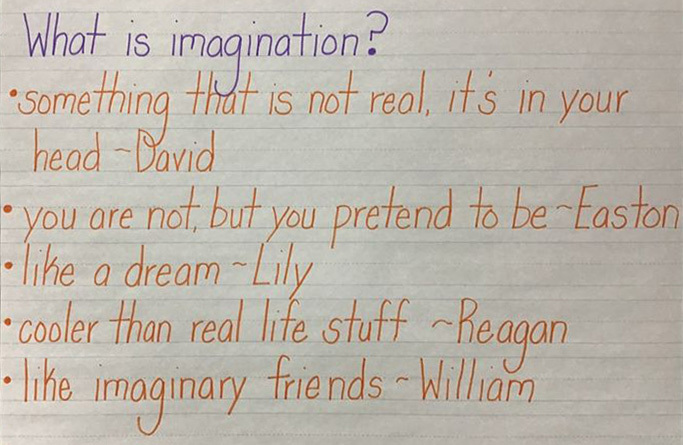 They also used the shape of a foot to spark a writing prompt, “Once I was a foot, now I…” In DREAMLab, students worked in teams to define and draw a “Wiglybot,” then presented their creations to the whole class. In the hands of our first graders, a squiggly line became a snake, a finger pointing at a bowl of fruit, a pogo stick, and more! Next up is a study of different types of poetry, including cinquains, haikus, couplets and acrostics. The Imagine That! unit is part of the IB Primary Years Programme Transdisciplinary Theme: How We Express Ourselves. Throughout the PYP (taught to children ages three – fifth grade), the transdisciplinary themes focus on issues that span subject areas. How We Express Ourselves is an inquiry into the ways in which we discover and express ideas, feelings, nature, culture, beliefs and values; the ways in which we reflect on, extend and enjoy our creativity; and our appreciation of the aesthetic.